Spanish police in Cambris kill five terrorists. Six civilians and police officer injured. Police in Spain announced overnight Thursday they had killed several suspects in an anti-terror operation in Cambrils, south of Barcelona, Fox News reports. The report cited state-owned broadcaster RTVE as having said police killed four people and injured another, after police suspected they were planning a second terror attack. Later reports said the fifth terrorist was killed as well. Catalan emergency services said six civilians and a police officer were injured in a ramming attack before the terrorists were killed. Police believe the second attack was linked to Thursday's Barcelona van attack. After they determined that the attackers were carrying explosive belts, Catalan police said on Twitter that a bomb squad in Cambrils would carry out several controlled explosions, according to Reuters. It was not immediately clear how the suspects killed in Cambrils were connected to the earlier van attack in Barcelona. 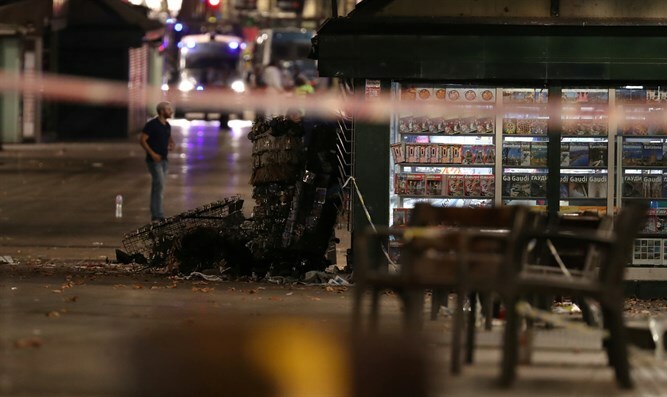 At least 13 people were killed and 100 injured in the earlier attack, which took place when a van drove into a crowd on the busy Las Rambla avenue. Authorities are on the hunt for the van driver, who they believe escaped on foot. Two men were arrested after the Barcelona attack, but police said that while they were connected to the incident, neither was the driver of the vehicle. One of the two men arrested was Moroccan and the other was from the Spanish enclave of Melilla in North Africa, reported Reuters. They were arrested in two different towns in the region of Catalonia, Ripoll and Alcanar. The Islamic State (ISIS) claimed responsibility for the Barcelona attack through its propaganda arm, the Amaq news agency.